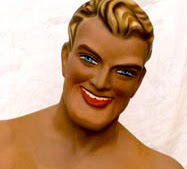 An icon of Australian manufacturing, the fictional Bond's advertising model, Chesty Bond, is a nostalgic testament to notions of mid 20th century machismo. 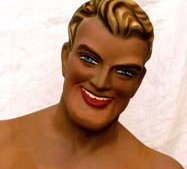 With his tanned torso, rippling chest muscles, over-size chin, wavy blonde hair and confident, white-toothed smile, his image spelt out T-E-S-T-O-S-T-E-R-O-N-E...the not so sub-text reading 'real men wear bonds'. Chesty bond was created by the Ad men in 1938 -chesty because singlets were Bond's thing and they needed a great torso to show off the wares. When Aussie men slipped on a Bond's singlet they could feel powerful by association. 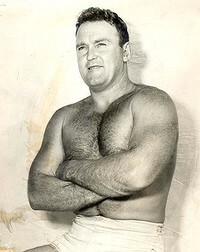 The original Chesty model was professional wrestler, Max Whitehead, who died in 2010 at 87. Vulcanised rubber models, which are now collectible, graced the underwear counter of major department stores. Vintage Chesty's are identifiable by a raised logo across the chest, which is absent from modern reproductions. In 1940 a cartoon version of Chesty Bond (by Syd Miller) began to feature regularly in newspaper advertisements and for the next few decades as well. Australians became as familiar with the jaw jutting man in the singlet as they were with Waltzing Matilda. Disappointingly, in 2009, the underwear company (Pacific Brands) that was an Australian-made fixture for so long moved shop offshore, closing 7 manufacturing plants in the process. Ah well, as Ned would say...such is industry.